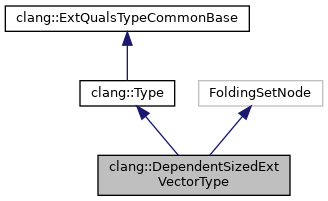 Represents an extended vector type where either the type or size is dependent. Definition at line 3140 of file Type.h. Definition at line 3162 of file Type.h. Definition at line 3160 of file Type.h. Definition at line 3157 of file Type.h. Referenced by clang::TextNodeDumper::VisitDependentSizedExtVectorType(), and clang::ASTTypeWriter::VisitTagType(). Definition at line 3156 of file Type.h. Referenced by clang::Type::hasAttr(), mangleAArch64VectorBase(), MarkUsedTemplateParameters(), clang::ASTNodeTraverser< Derived, NodeDelegateType >::VisitDependentSizedExtVectorType(), and clang::ASTTypeWriter::VisitTagType(). Definition at line 3155 of file Type.h. 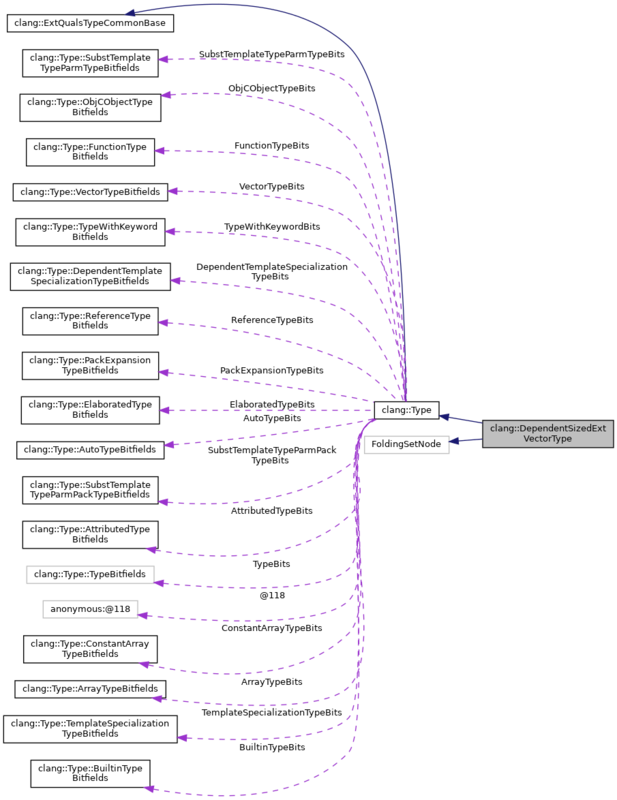 Referenced by mangleAArch64VectorBase(), MarkUsedTemplateParameters(), clang::ASTNodeTraverser< Derived, NodeDelegateType >::VisitDependentSizedExtVectorType(), and clang::ASTTypeWriter::VisitTagType(). Definition at line 3159 of file Type.h. Definition at line 3166 of file Type.h. Definition at line 216 of file Type.cpp. References clang::Expr::containsUnexpandedParameterPack(), clang::Type::containsUnexpandedParameterPack(), clang::QualType::getAsOpaquePtr(), clang::Type::isVariablyModifiedType(), clang::Stmt::Profile(), and Type. Definition at line 3141 of file Type.h.